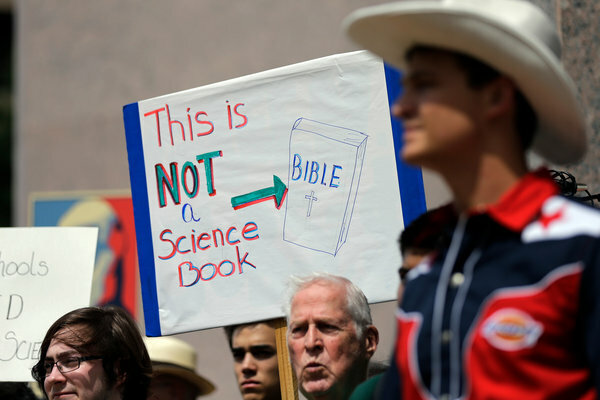 Stop me if you’ve heard this one before: Texas is seriously considering changes to its approved school textbook list due to reasons that clash with proven scientific fact. Its School Board was engaged in a battle. It led to a midnight meeting, heated debate, and now, a call for outside, unbiased review. You’d think that a battle this contentious would be over something pivotal to the education and well-being of the state’s students. Possibly it is over something that is so disputed and unproven that there has been no consensus on what is acceptable. Maybe someone is proposing a battery of wildly radical books that some school board members are having trouble accepting. That’s got to be the case, right? No. Not really. The most recent battle boils down to one book, a book published by Pearson Education. So what could be included in a science book from one of the country’s largest publishers that would cause such conflict? As usual, the debate is about the origins of the Earth and the progression of life. According to the Associated Press, “The concerns included differences of opinion on how long it took Earth to cool. Another objection called for emphasizing that modern discoveries in the fossil record reveal a ‘balance between gradualism and sudden appearance,’ suggesting that rather than developing over time, life got a boost from an intelligent designer.” So, natural selection and evolution are up for debate in classrooms now? This isn’t anything new. Texas has a history of tailoring its school curriculum to teach what they “like” versus what is accepted truth. In 2010, they successfully slanted social studies, history and economics towards conservative ideals and thinking, going to far as to require teachers to ” cover the Judeo-Christian influences of the nation’s Founding Fathers, but not highlight the philosophical rationale for the separation of church and state.” Just ignore one of the most important principles of our country in order to emphasize the role that Christianity has played in shaping out country. The irony is palpable. All of this is symptomatic of the battles being waged by our federal government in Washington. Just as Senators and House Representatives are supposed to represent the best interests of their constituents, the school board is supposed to advocate for the best education the state can provide. Yet when these elected representatives start acting based on their own beliefs, it is clear how quickly things can go awry. And if you think this isn’t important to you because you don’t live in Texas, think again. Book publishers tend to edit their books in order to meet the needs of the largest number of customers. In this case, that means that the larger states have the largest pull in shaping what information goes into school text books. And if you didn’t know, Texas is one of the largest states in the union. So you can do the math. In the end, conservatives lost this battle. Accepted science will continue to be taught in Texas schools. But if there is one thing we know about radicals (on the right or left sides of the political spectrum), we know that they don’t give up. This was just one battle about one textbook. The battle will inevitably rear its ugly head again over another textbook. Or curriculum. Or anything else some zealot deems not in line with how he or she believes things should be. So, to all those from Texas that might be reading this: Mobilize and get these fools voted out. For your kids and ours. That’s the only chance any of these kids have at getting a factual, quality education. August 30, 2013 March on Washington Coverage Garners Apology From Fox News’ Bill O’Reilly?